Cardamom is popular as a culinary spice for its warmth and pungency, but very few people know about its many therapeutic benefits. I fell in love with cardamom when a group of small-scale farmers and distillers in Ecuador gave me a sample to try. Since then, it has been one of my favorite oils, and I have used it as a key ingredient in many of my aromatherapy products including Fiesta Blend, Romance Blend, Memoria Blend, Headache Begone Roll-On and Digestive Body Oil. Here’s why. 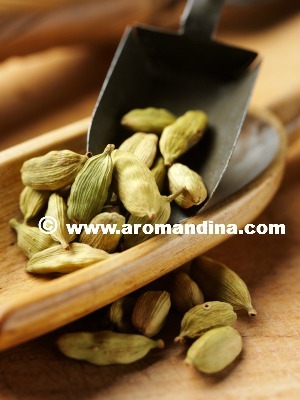 Cardamom’s potent carminative and antispasmodic properties help provide relief against indigestion, nausea, abdominal distension, colic, and flatulence, while its relaxant properties can provide a quick fix to annoying hiccups. To alleviate digestive discomfort, combine five drops of Cardamom, five drops of Orange, and five drops of Ginger essential oils with one fluid ounce of Carrier Oil. Apply the blend to the abdomen area and massage clockwise. For best results, apply a warm wet towel and a hot water bottle over the area. Rest for 15 minutes and feel your tummy slowly relax and heal itself. Cardamom has been described as an effective aid for headache relief, and a gentle tonic for the nervous system. It is also recommended for nervous exhaustion and depression because it has the dual ability to calm and sooth during phases of nervous tension, and enhance concentration during periods of sluggishness. Are you burdened with worries? Has stress affected your ability to focus and concentrate? Do you find yourself lost in thoughts and second-guessing everything? Cardamom is excellent for days when you find yourself emotionally overwhelmed and drained, which may in fact be symptoms of nervous exhaustion. Cardamom essential oil can help you unwind and strengthen your resolve in the face of challenges and responsibility — especially the sort that tests your endurance. Use the oil to enhance positive attributes such as clarity, direction, motivation, enthusiasm, confidence, courage, and purpose; and counteract negative attributes like apathy, confusion, inflexibility, intolerance, unreasonableness, sluggishness, and rigidity.